When I've not been drawing till my hands bleed, I've been playing guitar till my hands bleed. Bloody hands. Hard at work on new tunes...updates soon. Jammy Jam went well, I think. I'm afraid I wasn't loud enough again...will have to rectify that next time. Also, for an electronic musician who doesn't sing or mic any equipment, I seem to have an awful lot of problems with feedback. Hmm. Thank you everyone who showed up! I hope you had as much fun as I did. Not that this means anything to anyone but me. But this is the kind of stuff that, when you're a band, and you have a website, you're supposed to post there. I've owned this devilishly handsome Swedish keyboard for many years, but only today, after a good thrashing, did I have the idea of christening it. Its name is Ramunder (after an amazing song by the world's greatest band). Jammy jam is a go. I can't wait. chrismaverick is going out of his way to make it awesome, to the point where he and his neighbors are actually digging giant holes and erecting things. Meanwhile I'm frying my ears and my brain to cook up something special (but trying to avoid serious back injuries like last year's). Friday, July 27, shall be a very naked friday indeed. Happy birthday Mav & Steph! Looks like I'll be playing Jammy Jam again in a couple weeks. I'm so excited. And doomed. This one goes out to Franky Baby and the Marianettes. Whee! First batch of sound effects now available in the downloads section. My work here is done. Go Martians! Beat the snot out of those foolish earthlings! tremble before our flying discs!!! New song: Little Green Men are here. The song and the illustration are for Nugget and (menacing alias to be determined later)'s Ultimate Frisbee team that will be blasting the hell out of the Mars tournament next weekend. I'm getting an awesome dinner and some slave labor out of the deal. Alien music is almost done, and should be appearing here in a few days. I'm also drawing hordes of martians, which is fun, but I dread the coloring. Last night, dreamed of giant robots. It was good. Ostensibly at a party right now, but I had to take a break to listen to some tunes. The google ads peaked in quality a few days ago, but now seem to have dropped off a bit. I'll have to adjust the filter some more. Nugget has requested a song involving little green men. By Wednesday, or something crazy like that. 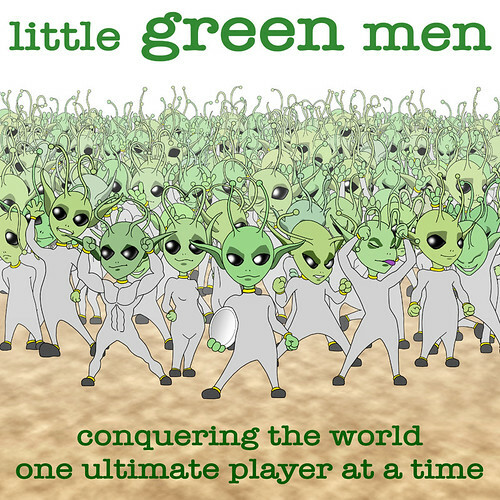 I made a prior committment to design a CD cover and label involving little green men. Also due Wednesday, or something crazy like that. It will be especially difficult since I plan to spend 11-12 hours in a movie theater monday and tuesday. I heard there's some sort of robot movie going on. Nugget is poor and can't pay me, so perhaps I'll force her to help me assemble a podcast to be posted here at a later date. Webby things are moving along. Google ads! Not quite as useful-looking as I had hoped, but maybe their targetting will get better when I have more content. Made new music today. A hunk of trance, for no good reason, in the middle of a DnB-ish track. We'll see how it goes. Guitars are sounding better, but not yet as good as they'd sound had I actually bought iZotope Trash, instead of having been just tricked into thinking I'd bought it before realizing that it cost ten times what I paid, and I had no serial number, and bad people now had my credit card number. Now the Russian Mafia is after me. Never buy software when your desire for a sick guitar sound right this instant is overriding your capacity for rational thought. Minion and I made cookies. Strange cookies. Almost sinister. My stomach hurts. No more empty links! Just a remarkable lack of content, still. However, I did upload a song. Knock yourself out. The buttons above don't work yet, but there will be lots of neat stuff here soon. I promise. For now I'm just happy I can display an LJ feed.